Food, water, medical supplies and other donations from New Yorkers will be delivered to assist those devastated by Hurricane Matthew in Haiti. 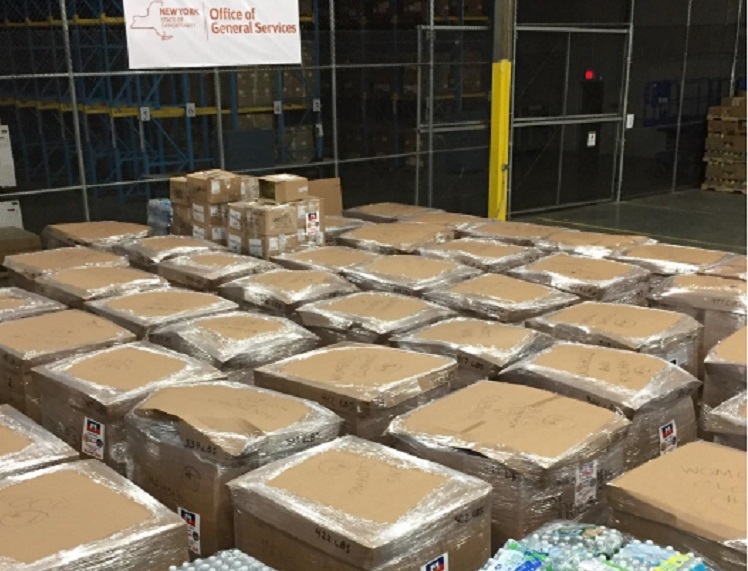 More than 30,000 pounds of food, water, medical supplies and other critical donations from New Yorkers to be delivered to Haiti. Albany, NY - December 8, 2016 - Governor Andrew M. Cuomo and Consul General Peter Helder Bernard, Esq. of the Consulate General of Haiti in New York today announced food, water, medical supplies and other donations from New Yorkers will be delivered to assist those devastated by Hurricane Matthew in Haiti. Photo courtesy of Governor's Press Office. The more than 30,000 pounds of donations on 60 pallets include food, water, hygiene products, medical supplies and clothing. New York, the Consulate, elected officials and local leaders worked together to gather items for those in need and provide support services for family members in New York following the hurricane earlier this year. Items will be transferred from the New York State Office of General Services warehouse in Brentwood by truck and rail to Florida, and then shipped to Haiti by the Consulate. Hurricane Matthew was a Category 4 storm when it hit the southwestern portion of Haiti on October 4, 2016. The effects of heavy rain, high winds and damaging tides took their toll on the country, its people and its land. Information provided by the Consulate General of Haiti in New York indicates the storm left nearly 500 people dead, approximately 150,000 homeless, and more than a million severely struggling for the means to survive. Six years after suffering a catastrophic earthquake claiming the lives of over 300,000 Haitians, the people of Haiti were yet again dealt a devastating blow as the storm ravaged farms and livestock, eliminating a prime source of food and destroyed communities including Jeremie, Grand Anse, Les Cayes, Nippes. Ongoing challenges for the Haitian people include addressing the Cholera epidemic and supplying those affected by Hurricane Matthew with the basic amenities of life. In response, the Consulate General of the Republic of Haiti in NY, the office of Governor Andrew M. Cuomo, community organizations including the National Action Network, local and state government officials, and many others joined forces to help the people of Haiti. The Haitian Consulate worked with the Governor’s office to help manage logistics for community donations and the New York National Guard picked up the collected items at more than 25 state office locations throughout the State and delivered them to State warehouse locations in Albany and Brentwood. The Office of General Services packaged the items and readied the donations for shipment. Photos of the donation packaging are available here. Subject: LongIsland.com - Your Name sent you Article details of "Governor Cuomo and Consulate General of Haiti in NY Announce Hurricane Matthew Donations Headed for Haiti"